It’s about to be strawberry season in Ontario, the best seasons ever! 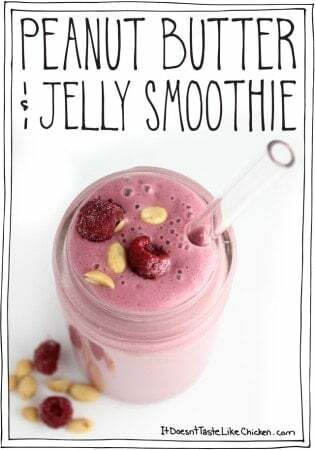 I’m so excited I needed to get my strawberry flavours going ahead of time with this 3 Ingredient Vegan Strawberry Milk. Secret: I may be a city slicker now, but I actually grew up as a country bumpkin. And if you’re a country bumpkin you know the BEST way to eat strawberries is in your car. Let me explain, when it’s strawberry season in the country, these roadside strawberry stands pop up everywhere. Some are full on strawberry businesses, and some are just families that happen to have a large strawberry patch. So when you stop by one of these stands (which you must do on every drive) the rule is to pick up one basket for your house, and one for the car. The strawberries are still warm from the sun and they taste like little sweet sun jewels. Pure bliss. So naturally, the entire car basket is consumed on the drive home. (Hence why two baskets are required). I’m getting so excited for strawberry season that I just couldn’t wait to get my strawberry fix! 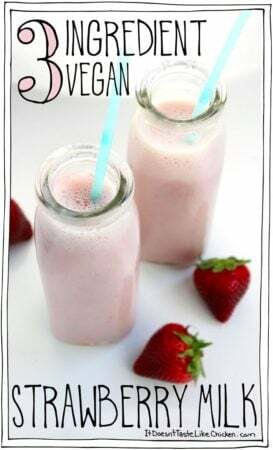 This 3 Ingredient Vegan Strawberry Milk is the perfect way to use up leftover strawberries (as if that’s a thing) or frozen strawberries to make a fun little treat. 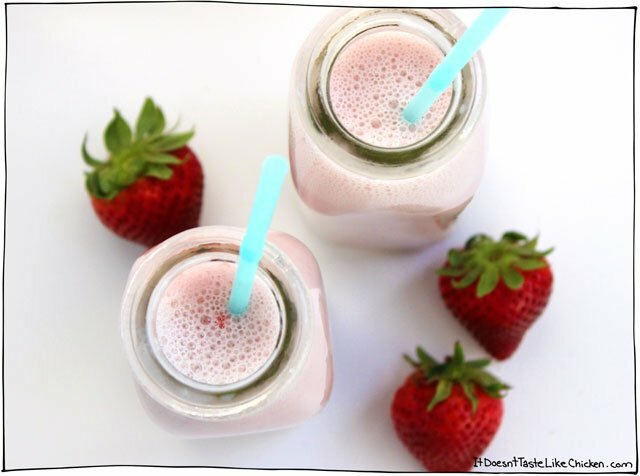 This homemade vegan strawberry milk is so much better than store-bought versions. 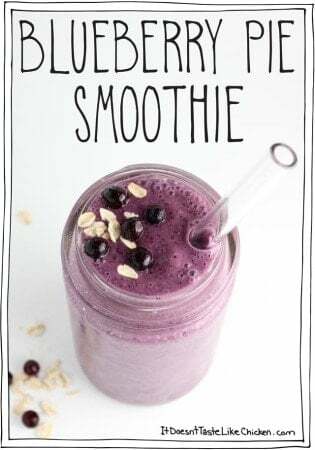 All natural, no dies or artificial flavours, and takes just 15 minutes to make! And it tastes like REAL strawberries and not some sort of weird artifical flavour. If strawberry milk ain’t your thing, I would first say, are you sure? Try it. It tastes like a light version of melted strawberry ice cream. Then I would also tell you that you can use this strawberry syrup on pancakes, over vegan ice cream, on oatmeal, or anywhere syrup will go. To make 3 Ingredient Vegan Strawberry Milk: add your strawberries (fresh or frozen) to a pot with water and agave. Bring to a simmer and cook for 5 to 10 minutes until the strawberries have basically turned to mush. Put a fine mesh strainer over a bowl, and pour the strawberry mixture in. 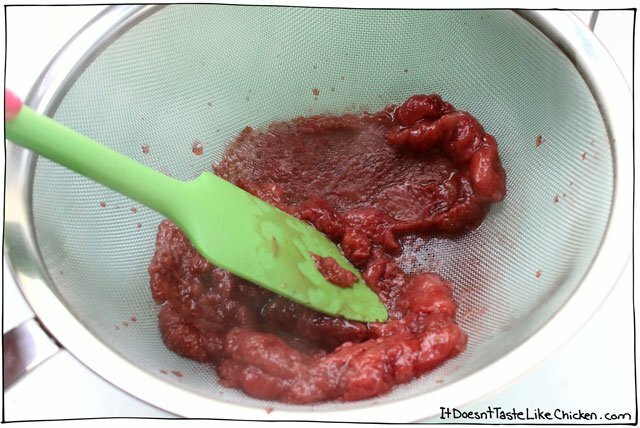 Use a spatula to smush the strawberries through the strainer as best as you can. Leftover strawberry mush can be used on top of oatmeal, in a smoothie, or just spread on toast. It tastes like a lightly sweet jam! And now you are left with your gorgeous syrup! 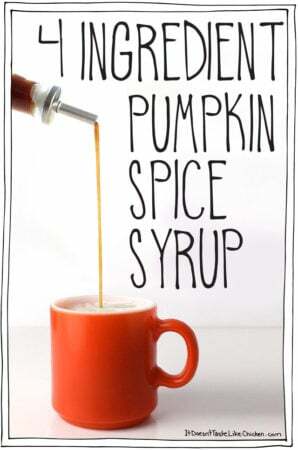 If you prefer a sweeter syrup, just stir in more sweetener now. To make strawberry milk, pour a glass of your favourite non-dairy milk and add the syrup to taste. 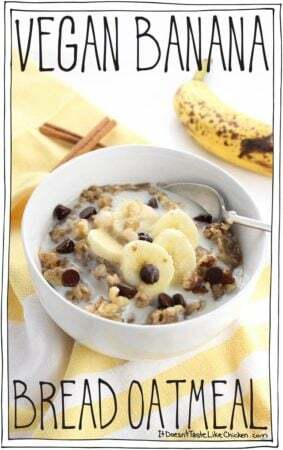 I like about 3 tablespoons per 1 cup non-dairy milk. akes just 15 minutes to make and tastes like REAL strawberries. 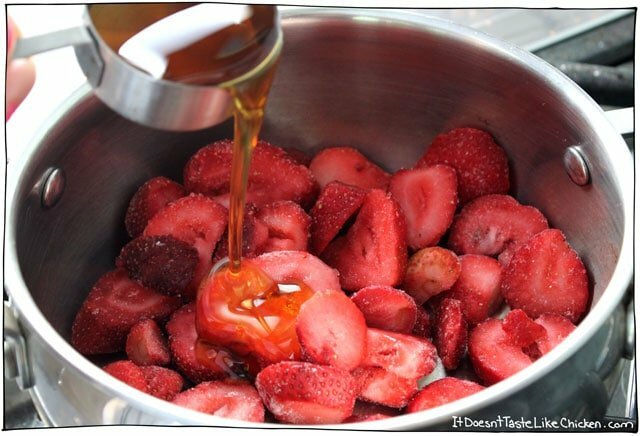 In a small pot, add the strawberries, 1/4 cup of the agave, and water. 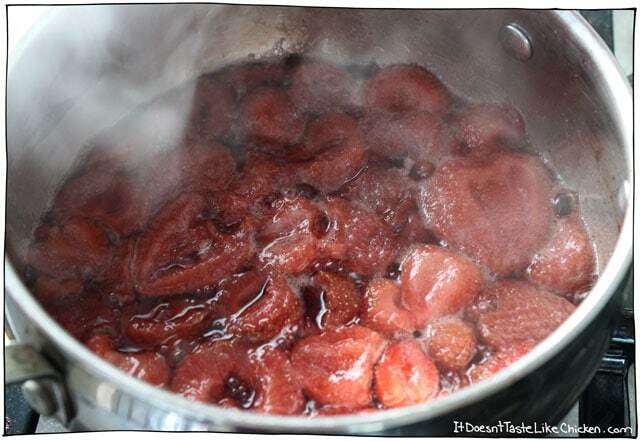 Bring to a simmer and cook for 5 to 10 minutes until the strawberries have basically turned to mush. Put a fine mesh strainer over a bowl and pour the strawberry mixture in. Use a spatula to smush the strawberries through the strainer as best as you can. Leftover strawberry mush can be used on top of oatmeal, in a smoothie, or just spread on toast. It tastes like a lightly sweet jam! And now you are left with your gorgeous syrup! If you prefer a sweeter syrup, just add up to 1/4 cup more agave to taste. 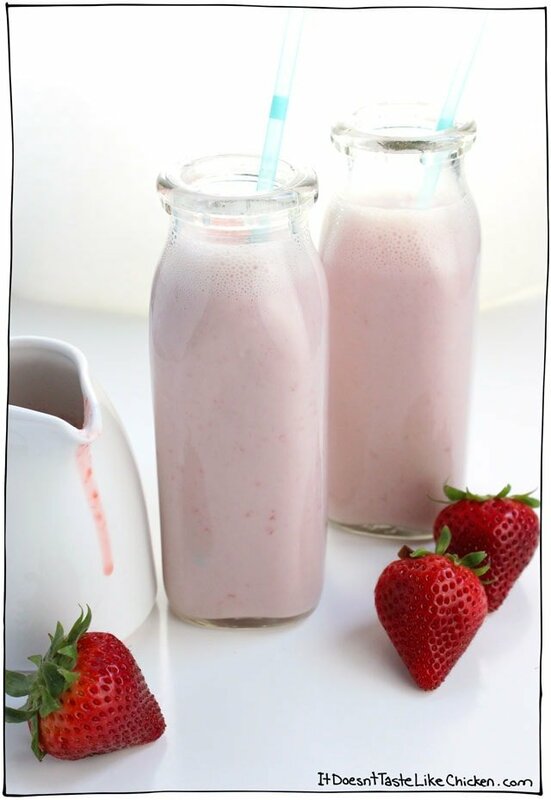 To make strawberry milk: pour a glass of your favourite non-dairy milk and add the syrup to taste. 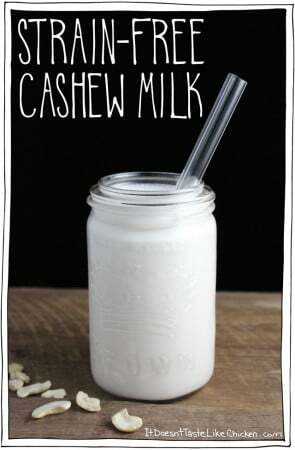 I like about 3 tablespoons per 1 cup non-dairy milk. Definitely going to make many more times again! Super kid-friendly! Especially when the kid LOVES everything Pink!!! Easy and soooo fresh. 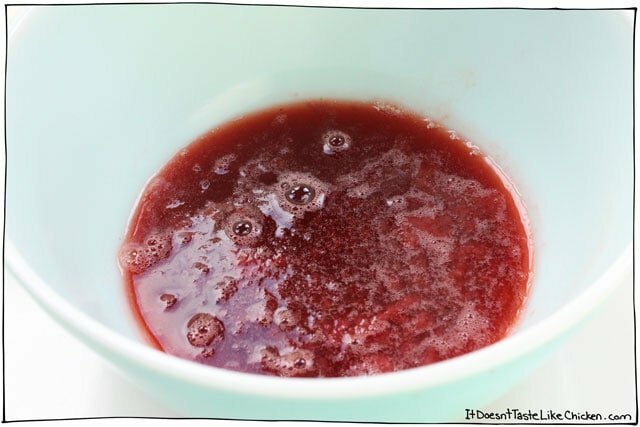 As for your suggestion to use the strawberry mush in smoothies or as jam…. bwahahaha!!!! My idea: just eat it! Nomnomnom!!!! So good! Thanks for the great idea, Sam! What alternative sweetener could you use? Honey? Haha, I hope you love it, Andrea! Hmmm, I am also thinking, freeze into Popsicles! Yum! 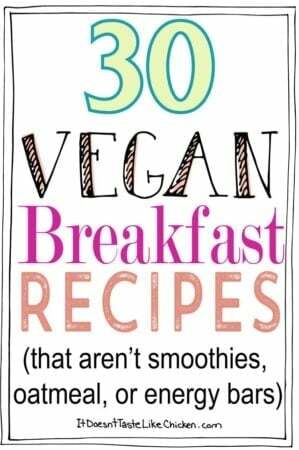 I bet that would be delicious! 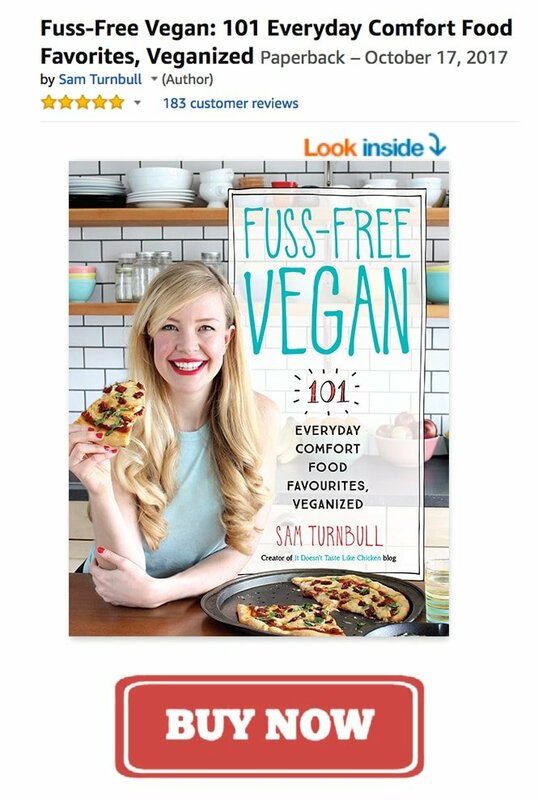 Okay, so I never would have thought to try this and now that I’ve read this post, I can’t wait! I love strawberry milk, but since telling myself I’d avoid processed foods, I haven’t even looked at those bright red bottles of strawberry syrup at the grocery store. Solution found!